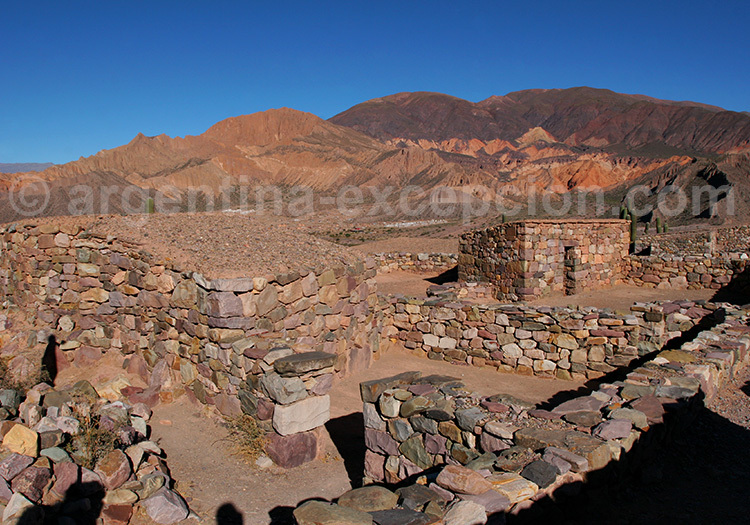 Discover the Quedrada de Humahuaca, one of the most beautiful place in Argentina. The Quebrada de Humahuaca is a 96-mile long valley that follows Río Grande in the province of Jujuy in the Northwest of Argentina. It connects the high plateau of the Puna with Bolivia and is home to many villages: Purmamarca, Maimará, Tilcara, and Humahuaca. This fertile valley is more densely populated than the arid plateau and has been considered a natural communication road between the altiplano and the plains for over 10,000 years. The Tropic of Capricorn, signposted at the side of the road, crosses Huacalera between Tilcara and Humahuaca. Winters are cold, but also dry and sunny, which make it the best season to visit the Quebrada. The temperature varies greatly between day and night all year round in this region. 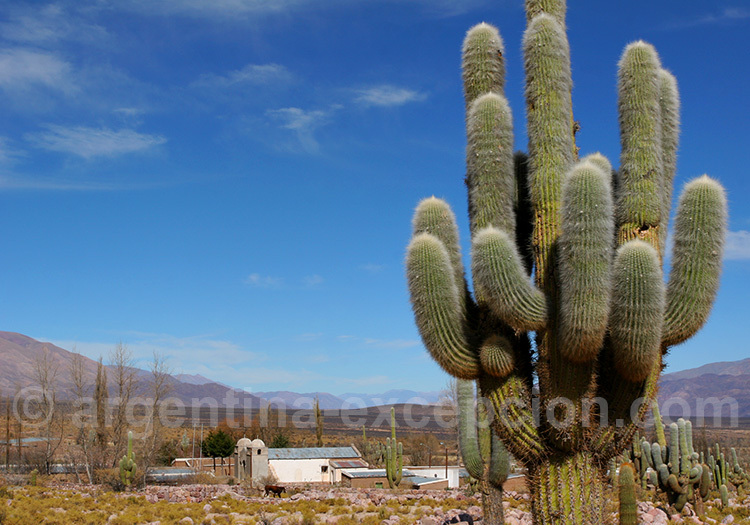 The Puna plateau, west of the provinces of Salta and Jujuy, is located at a median altitude of 11,500 feet above sea level, and is punctuated by volcanoes and salt flats. This extremely arid region is thinly settled. The air has little oxygen and can provoke vertigo and headaches. It is advisable to drive with the windows open, avoid heavy food and alcohol, breathe slowly and limit physical exercise until one is used to the altitude. Indigenous people chew coca leaves to prevent “apunamiento”, or altitude sickness. The first traces of settlement in the Quebrada de Humahuaca date back more than 10,000 years to when a nomad population of hunter-gatherers close to the Andean civilization entered the region. The Omaguacas gave their name to a valley and a village. During the first millennium, the inhabitants organized themselves and built Pucarás, or fortresses. You can still admire some of these ruins in Tilcara. The Diaguitas mastered the art of ceramics and of terraced agriculture, and they grew corn, potatoes, squash and quinoa, which were stored underground after the harvest. They also believed in life after death and buried their dead in the fetal position with clothes and food. In 1480, the Incan empire conquered the area and stayed until the arrival of the Spanish colonizers in the sixteenth century. The conquistadors faced strong indigenous resistance, which they finally defeated in 1598. The villages were brought to heel by the new occupants, who decided to keep using this strategic commercial road between the rich silver mines of Potosí and the Atlantic Ocean. 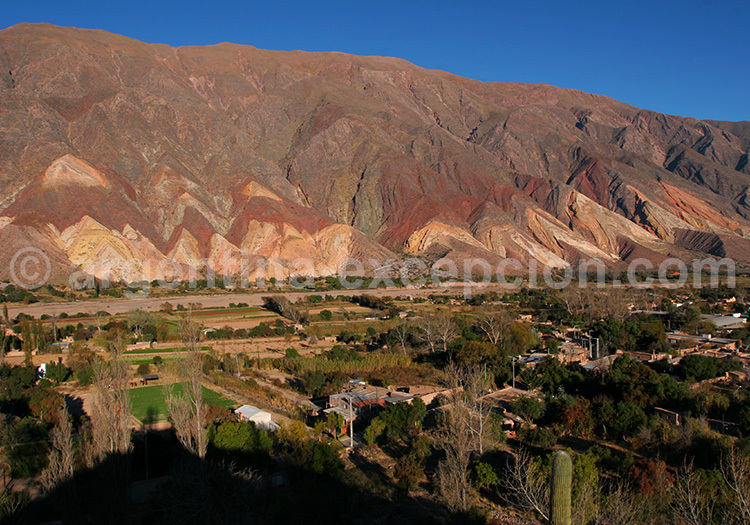 The Quebrada de Humahuaca boasts one of the best preserved indigenous traditions and cultures in Argentina. Every 1st of August, the inhabitants celebrate Pachamama, or Mother Earth. They offer her presents on small altars along the roads. The arrival of the Spanish provoked a religious merging between indigenous and Catholic beliefs. Today, Inti Rami, the Aymara Sun celebration, and the Holy Week are celebrated with the same ardor. The folklore tradition is very strong in the Northwest and the city of Tilcara organizes several celebrations during the month of January when people gather at “peñas” to listen to music and dance the “chacarera” or the “gato”. The Carnival of the North is known across the entire country, and particularly Humahuaca’s, which lasts for nine days in February. The inhabitants parade through the village in costumes and colorful masks, marching to the rhythm of the charango (guitar), bombo (drum) and erke (a large flute). The celebrations start with the “desentierro del Pujllay”: they dig up a little devil, the symbol of joy and festivities, who spent a year in the mountains. 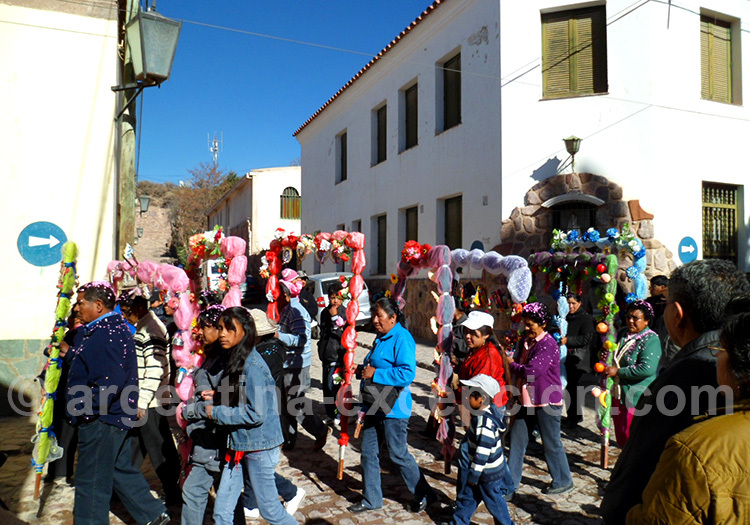 On the last day of Carnival, the “Sunday of temptations”, the “cacharpaya” takes place. They rebury the devil in the mountains with offerings (coca leaves, chichi, cigarettes, etc.) to thank Pachamama for her gifts. 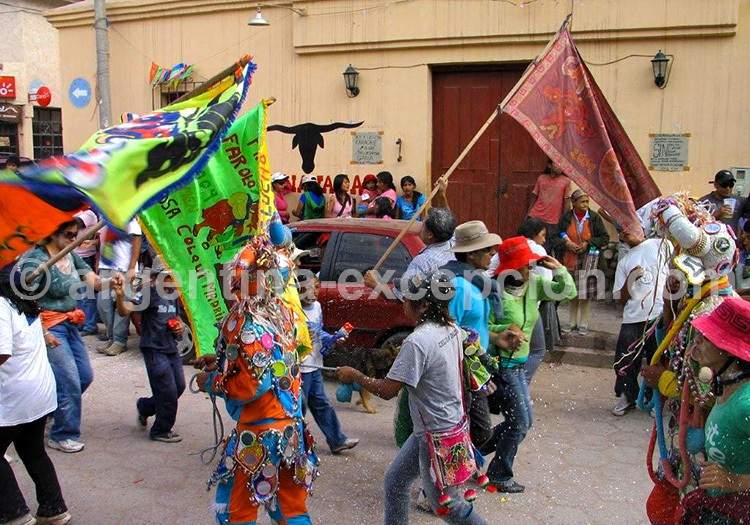 January : Tilcara celebrations with a folklore festival, peñas, dances, and exhibitions. 21st June : Inti Rami celebration (Sun celebration). This Aymara tradition celebrates the winter solstice and a new cycle for agriculture in Huacalera, through which the Tropic of Capricorn passes. August : Pachamama celebration. Offerings of food, drink, and coca leaves are prepared according to the Andean tradition. 2nd November : Souls day. Figurines and beloved objects of the deceased are sculpted in a bread pastry, and beverages and little staircases are prepared so that the souls can feed themselves and go back to heaven after having visited their relatives. 10th November : Tradition Day. As everywhere else, this is the Gaucho’s festival and a good occasion to admire their riding dexterity. There are also folklore performances. What to see in Purmamarca ? 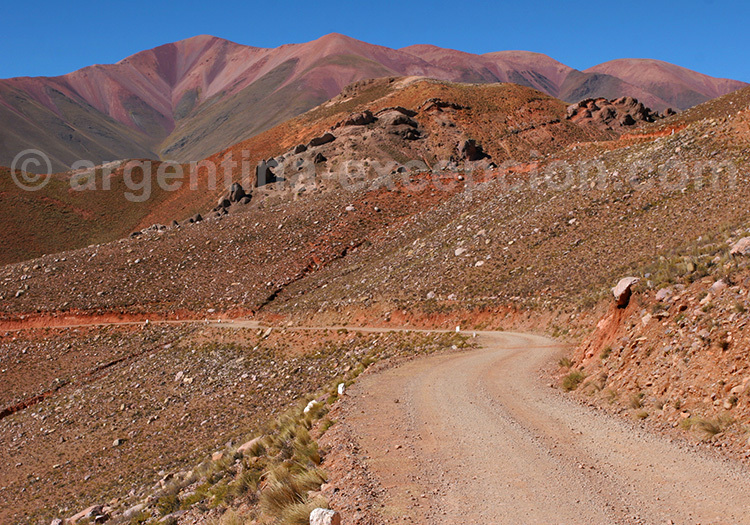 A short detour from Route 9, 35 miles North of Jujuy, Purmarmarca is definitely worth a trip. 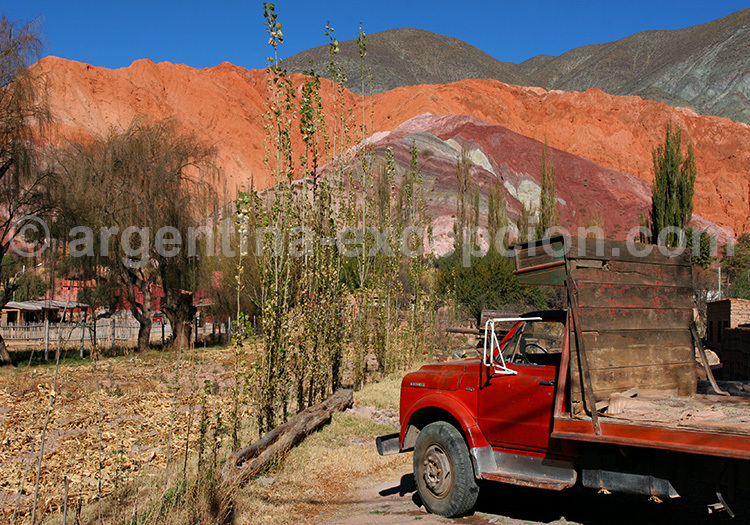 The village is located between Purmamarca River, which is lined with poplar trees, and Cerro de los Siete Colores. The Hill of Seven Colors is one of the most beautiful landscapes of the Northwest. The sedimentary layers, ranging from ochre to red, green and yellow, can be very precisely distinguished. We recommend hiking around the mountain. The local craftsmen gather around the park of the village to sell clothes made from llama or vicune wool, rugs, jewelry, etc. The white church is very picturesque with its organ-pipe cacti roof structure and its cemetery decorated with colorful ribbons. What to see in Maimara ? 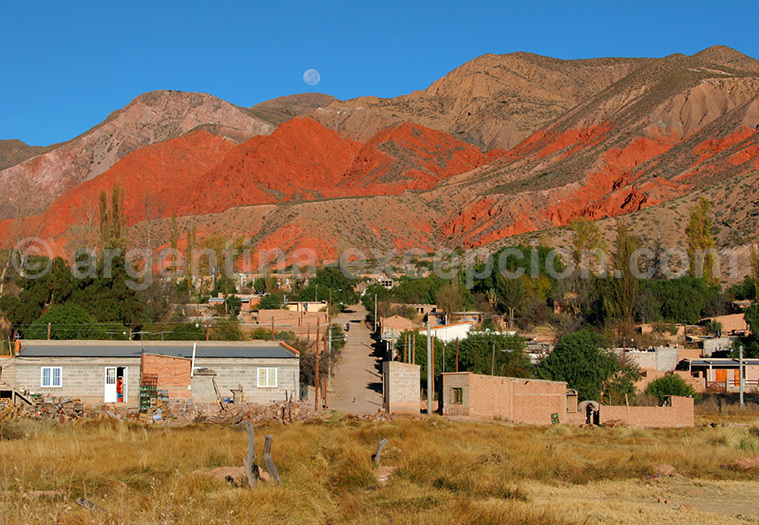 The village of Maimará is located at the bottom of another of the Quebrada’s astonishing landscapes: la Paleta del Pintor (the Painter’s Palette). Large slabs of multicolored rocks, in ochre, red and green, compose a beautiful, natural painting. The cemetery on the hill is particularly picturesque. About two miles away from the village, you can see the old colonial building of the Posta de Hornillos, a relay post office built in 1772 on the road between the Viceroyalties of Upper Peru and Rio de la Plata. It later served as headquarters to the armies that fought for Argentina’s independence, and today the Posta de Hornillos has been converted into a historical museum. What to see in Tilcara ? 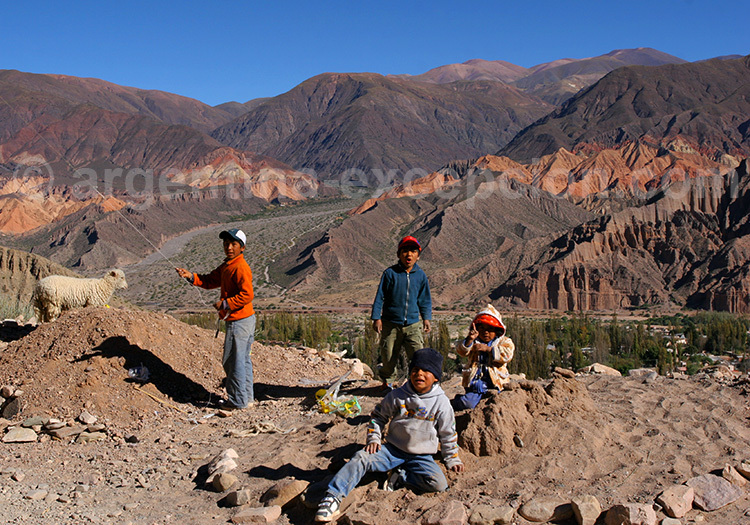 Tilcara is the liveliest of the Quebrada villages, especially during the January celebrations. It also offers the best colonial architecture and the most beautiful archeological heritage. 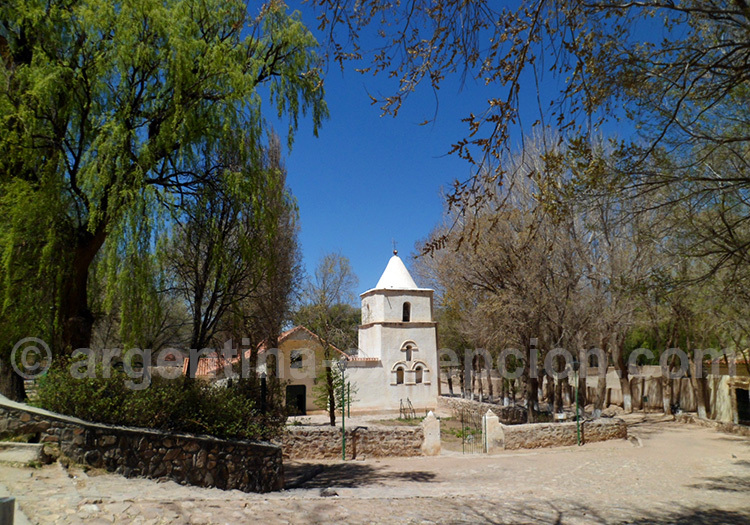 The village is named after the Tilcara people, who built the fortress that overlooks the Río Grande nine centuries ago. Today, you can still admire the restored ruins of the pucará, a few miles away from the village. The objects found during the excavation of the fortress are presented in the archeological museum of the village. From the fortress site, one can distinguish the houses, the graves, and the animals’ corrals in a beautiful landscape surrounded by organ-pipe cacti down below. At the top the hill, a pyramid has been built to pay tribute to the archeologists who studied and restored the pucará. At the entrance to the archeological site, a high-altitude botanical garden is a pleasant place for a stroll. What to see in Uquia ? In the white church of this tiny village, one can admire rare seventeenth-century paintings done by Indians of the Cusco School. They show angels dressed in flamboyant clothes, wearing large hats and arquebus. 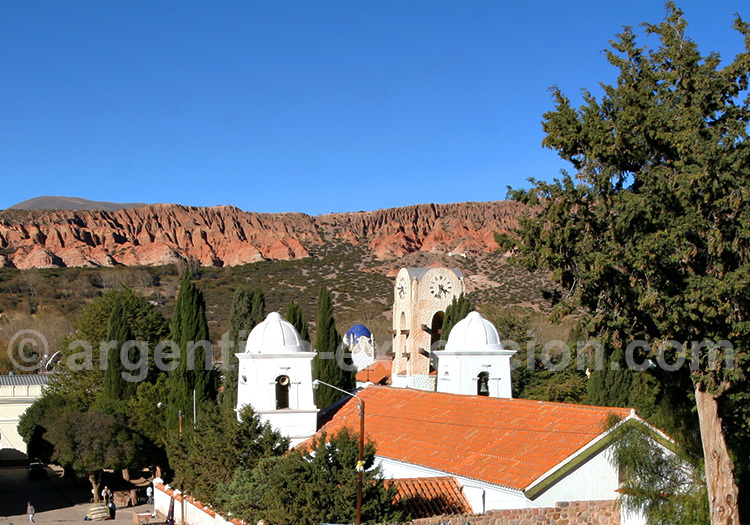 Like everywhere else in the Quebrada, the village is surrounded by mountains and giant cacti. What to see in Humahuaca ? The last stop in the Quebrada, Humahuaca is the most densely populated village (11,500 inhabitants) and the highest one (almost 9,840 feet above sea level). Pretty colonial houses have been preserved along the cobblestone streets. From the central park, stairs lead to the Monument of Independence built in 1950. From there one can see the entire village. Craftsmen sell clothes and other objects on the stairs or in tiny shops, and children usually recite poems and offer to guide tourists for a couple of pesos. There are interesting paintings from the Cusco School in the Iglesia de la Candelaria. On the other side of the plaza, the Cabildo’s clock tower is a local curiosity, with its life-sized figure of San Francisco Solano who comes out every day at noon to give his blessing. The February carnival is well known and particularly picturesque with its colorful costumes inspired by Bolivian and Peruvian traditions. Costumes and instruments are on display at the Regional Folkloric Museum. What to see in Iruya ? The village of Iruya is located at 9,120 feet above sea level at the end of a 30-mile trail detour off the main Jujuy-to-Bolivia road. The road is 13,100 feet above sea level. It is advisable to ask about the condition of the road before driving it. This isolated village has kept its Indian traditions. With its whitewashed houses, bordered by two rivers, the view from Iruya is breathtaking. What to see in La Quiaca ? Located on the altiplano, 175 miles away from Jujuy, La Quiaca is the last village before Bolivia. A bridge over the ravine leads to Villazón, Bolivia. The landscape of high plateau from Humahuaca is mind-blowing but beware of altitude sickness. 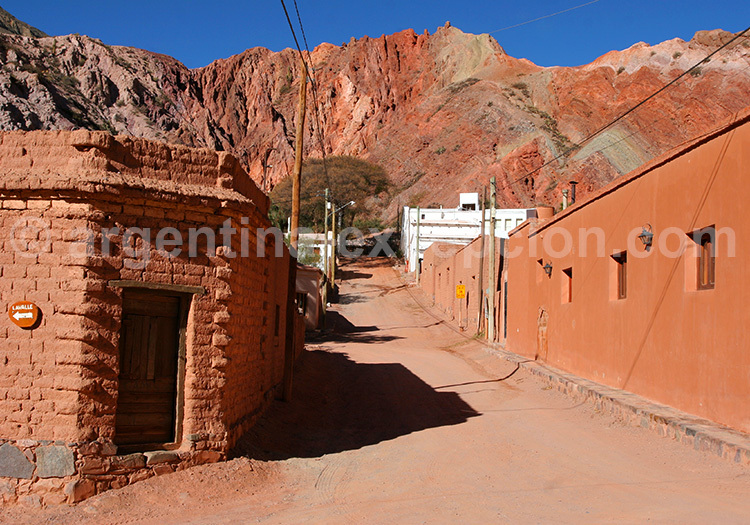 Hotels and estancias : where to sleep in Quebrada de Humahuaca? 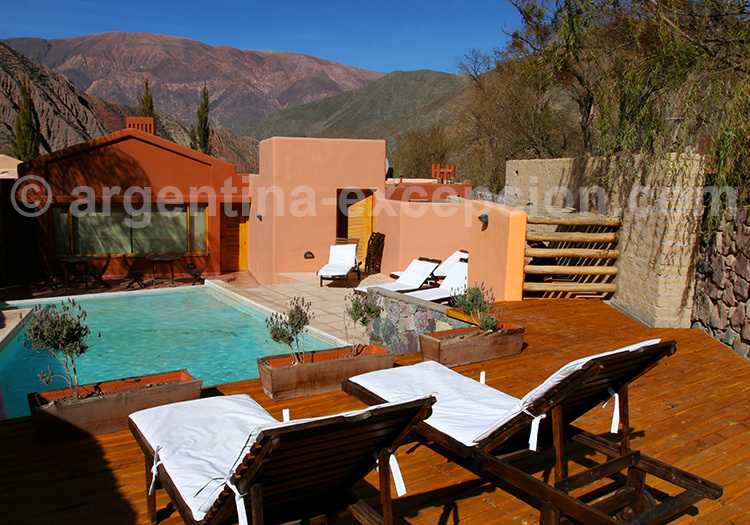 Hotel La Comarca : a charming hotel built in harmony with Purmamarca’s landscape. Hotel El Manantial del Silencio : a small, colonial-style luxury hotel with a superb view of the Hill of Seven Colors in Purmamarca. A recommended gastronomical stop. Hotel Rincón de fuego : a luxury Andean-style inn. A cool and calm haven and a great gastronomical stop. 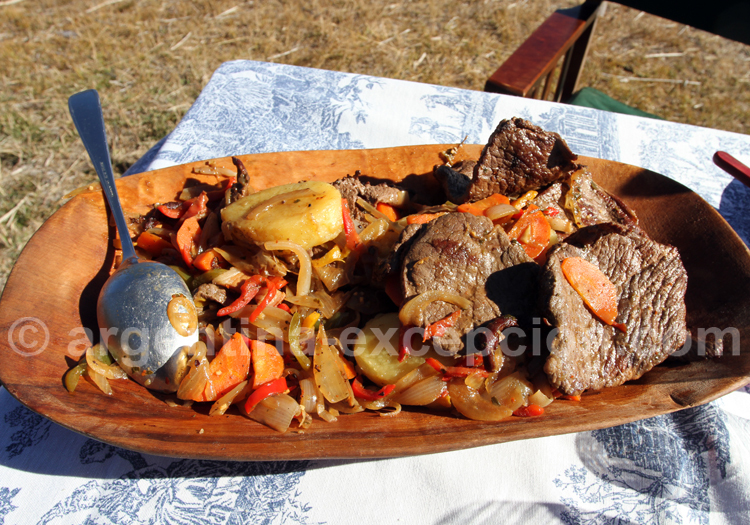 Gastronomy : what to eat in the Quebrada de Humahuaca ? Empanadas : Meat and vegetable-stuffed pasties. Locro : a stew made of corn, white beans, squash, beef and bacon. Tamal : steamed corn dough with meat, wrapped and cooked in a cornhusk. Humita : choclo dough (young corn), milk and sugar cooked in a cornhusk. Quinoa : This Andean grain that was once forgotten is now back on our plates! It can be eaten like rice: in salad, in risotto or as a pudding. It’s very nutritious and contains protein, iron and amino acids. Cabrito : kid cooked in a stew or grilled. Cayote : a local fruit that can be eaten in jam or jelly. Chicha : a drink made of fermented corn, very popular during the festivals. Coca : coca leaves are used for herbal tea. It is forbidden to sell and transport the coca leaves in Argentina, however its use by local populations is tolerated. Restaurants : where to eat in the Quebrada de Humahuaca ? La Chacana in Tilcara : La Chacana, Tierra Azul’s restaurant is located in the center of the village. 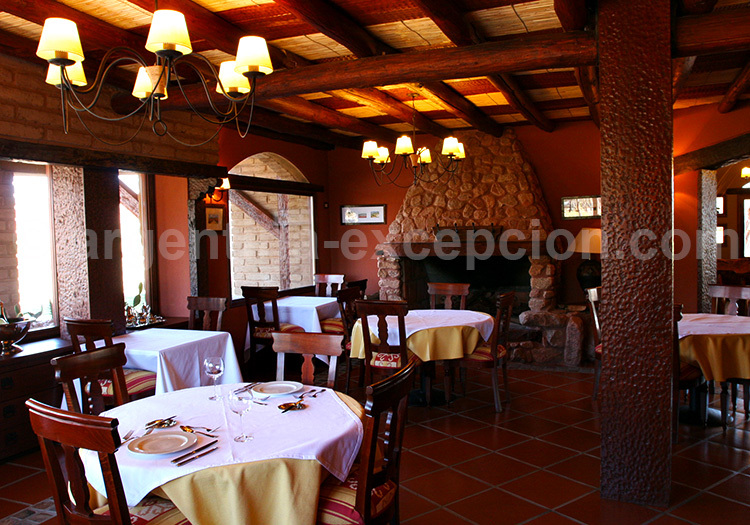 With its charming decoration and its quality dishes largely inspired in Andean cuisine, this restaurant is ideal for a gastronomic stop in Quebrada de Humahuaca. Open all year round every day. El Churqui in Purmamarca : in the heart of Purmamarca’s historic center, the restaurant Los Morteros successfully combines traditional architecture and innovative design. The atmosphere echoes its reinvented traditional cuisine, including llama meat and Andean potatoes. Open for lunch and dinner. Transportation : how to get to Quebrada de Humahuaca ? 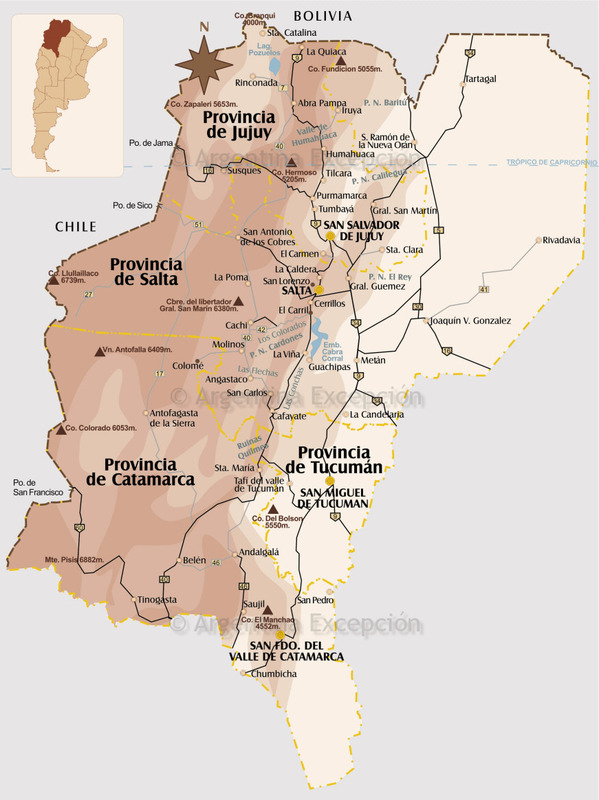 For long distances, Salta offers more frequencies than San Salvador de Jujuy. Plane : daily flight from Buenos Aires city to Jujuy airport with Aerolíneas Argentinas. 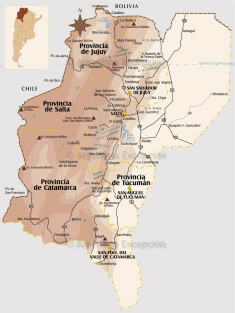 Salta airport, located 75 miles away, also offers flights to Tucumán and Córdoba. Bus : from Jujuy it is 22 hours to Buenos Aires, 2 hours to Salta and Tilcara, 2½ hours to Humahuaca, and about 5 hours to La Quiaca. Car : tilcara is located 26 miles North of Jujuy on the RN-9 and 100 miles away from Salta; Humahuaca is 76 miles away from Jujuy and 151 miles away from Salta. Salinas grandes : from Purmamarca, the zigzagging Route 42 to Salinas Grandes is breathtaking, reaching Lipán at 13,681 feet above sea level. This 16,000-hectare salt-filled lake is located at 12,467 feet above sea level. Salt is collected in the traditional manner in the sharp wind of the Puna. The workers, warmly dressed and protected by balaclavas, sell souvenirs made of salt. Despite the harsh conditions of this extreme altitude desert, the biodiversity is remarkable. Indeed, vicuñas and suris (Andean family of the rheas) have adapted to the lack of oxygen and the drastic changes in temperature. San Antonio de los Cobres : Located at 12,380 feet above sea level, the village of San Antonio de los Cobres was one of the most important train stations along the route of the Train to the clouds (Tren de las Nubes). 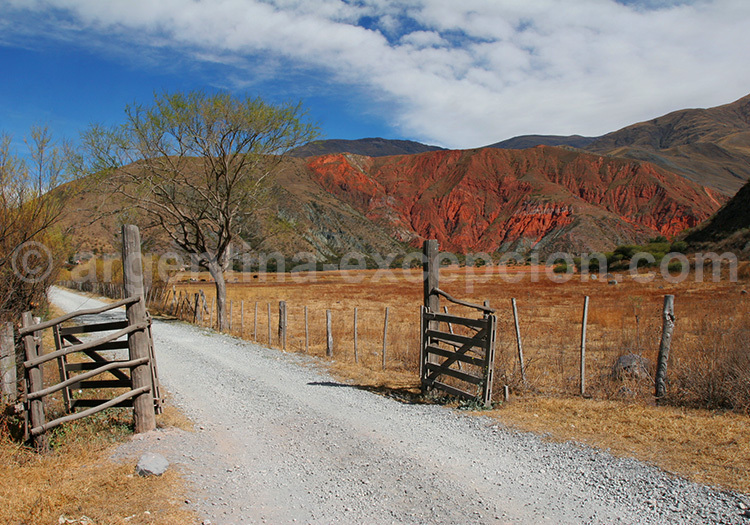 A badly maintained road leads to this isolated village on the border of the provinces of Salta and Jujuy. For the inhabitants, mostly of indigenous descent, living conditions are extremely harsh: the air contains little oxygen, the sky is a metallic blue and the sun is scorching. 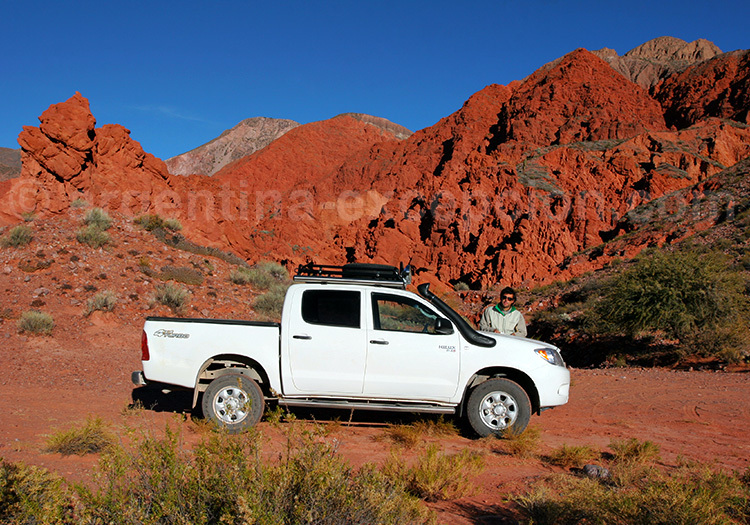 Fly and drive Salta, Calchaquí Valleys, Cafayate, Quebrada de Humahuaca: 12 days around the most beautiful sites of Salta region. Category of accommodation: charm. Exceptional tour from the Northwest to Iguazu falls: 15 days of travel with a driver-guide to admire two of the most spectacular landscapes of Argentina, the Salta region and the falls. Category of accommodation: exception.